Toy fads come and go but only few are here to stay. One among them is the timeless doll house. A prized possession, a doll house opens up a child’s imagination to countless creative possibilities. They have charmed kids and adults alike, the latter even going on to pass theirs from generation to generation. Doll houses are cherished the world over and have stood the test of time. This is just another testament to how much they are cherished and loved by people. In the old days, doll houses weren’t easily available so people would make their own doll houses. Today, there are several options available online. To help you choose and get started on your doll-venture, we are bringing to you ten different doll house toys. Read on to know more. 4. Boley Pretend Play Doll House Toy – 21-piece collapsible dollhouse. 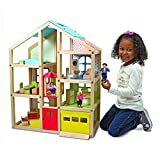 Boley Pretend Play American Doll House Toy Playset - 21-Piece Portable Dollhouse, a Perfect Toddler Girls and Kids' Toy with Family, Pets, Kitchen Accessories, Lights and Sound Doorbell and More! This beautifully detailed living room set boasts a light up fireplace along with a host of other accessories such as a couch and a pair of matching chairs, newspapers, coffee maker, coffee table and more. When combined with the Calico Critters, the distinct animal characters that live in the blissful village of Calico, kids 3 years and over learn family values and develop their cognitive and motor skills through pretend play. These classic toys have roused the imagination and creativity of innumerable children. This modern dollhouse comes with 15 pieces of furniture. Catering to both girls and boys with its gender-neutral colors, it appeals to the modern-day architecture. It has a centrally situated elevator that is a marked difference from the more traditional dollhouses. It also has a lift-up door garage. Both these features allure the kid of today who is used to such components in real life. An open floor plan makes it easily accessible and shareable among multiple children. This is an excellent option for families with multiple children and preschools. This magnificent wooden dollhouse provides the ultimate ‘home away from home’ experience for children aged 3 years and above. In addition to 11 wooden furniture pieces, the dollhouse comes with two flexible wooden play dolls. Easy to access, this two-storeyed dollhouse comes fully assembled. True to its name, it can be easily folded open or closed during a play date. Since it is mobile, it allows children to tag it along with them. Besides allowing children to pretend play with the furniture and the wooden toys, the dollhouse also stimulated their cognitive skills by allowing them to locate shapes like squares, triangles etc. 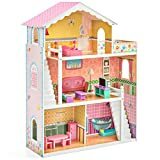 This is a 3-storey easy-to-assemble dollhouse that comes with 17 mini wooden furniture along with a living room, bathroom, bedroom, kitchen, balcony and stairs. It has an extremely environment friendly and non-toxic design that promises a lot of fun. Dolls up to 14” can be housed within it. The dimensions of the dollhouse are large enough so that several children aged 3 and over can play at the same time. This dollhouse is essentially a large six-room southern mansion four storeys tall. Recommended for children aged three and up, it spells grace throughout. It comes as fully furnished with 14 pieces of beautiful wooden furniture. It has six rooms of open space and wide-open windows to provide easy access and visibility into the rooms. It can house a doll up to 12” tall and comes replete with cushions for the love seat and bed linens. Initial assembly is recommended to be done by an adult since it might require a powered screwdriver. This is an ideal toy for several children to play with at the same time, encouraging numerous pretend-play opportunities. This easily foldable dollhouse has 4 floors and 6 vast rooms and comes with a flip-out swing set that contains a pair of swings. This provides children a perfect opportunity to recreate a smaller version of their own homes. With its fun Mom, Dad and Baby toys, it allows them to role play different characters that they are familiar with in their day-to-day lives. There is a doggy door as well as a special baby seat in the swing set. Watch your child decide the specifics of furniture placements and making life’s decisions with this dollhouse, paving way for oodles of fun as they re-enact a situation that they experienced in real life. 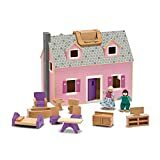 Specifically targeted for girls, this beautiful foldable pop-up dollhouse comprises of family action figures besides furniture. It is intricately illustrated with all the details pertaining to a real-life house. It provides a wonderful way for little girls to grasp common etiquette and rules. They can enact imaginative scenes from the kitchen to the outdoor patio. There is no limit to how wild your child’s imagination can run with this perfect dollhouse. This Happy Home comes loaded with 1 Popette Lil’ Shoppie and adorably cute 1 Large, 2 Medium, 2 Small and 2 Mini Petkins. The Petkins furniture can be displayed and arranged all over to magically transform the house into a beautiful Happy Place. This cute little house is sure to keep your little one busy! This dollhouse is a 2-storyed, 5 room luxury town home that comes with 2 Critters: Sweet-pea Rabbit Mother and Sweet-pea Rabbit Sister. Besides the basic rooms, it also has a piano and bench, working lights, a kitchen cart loaded with accessories and much more. They hone a child’s cognitive and fine motor skills through role playing in the fun easily changeable environments. This red-roofed two-storeyed cottage is the perfect for first time Calico Critters fans. 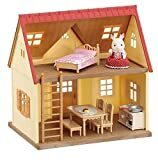 With over 15 furnishings and accessories such as a bed with sheets, kitchen counter with sink and storage etc., this toy set comes fully assembled and can host all Calico Critters characters besides the Bell Hopscotch Rabbit. The first floor is moveable and reversible and can be used as a front yard. This dollhouse is our top pick as it promotes learning while emphasizing on having a lot of fun. Like with all other Calico Critters play sets, this Cozy Cottage encourages children to sharpen their narrative and critical thinking skills.